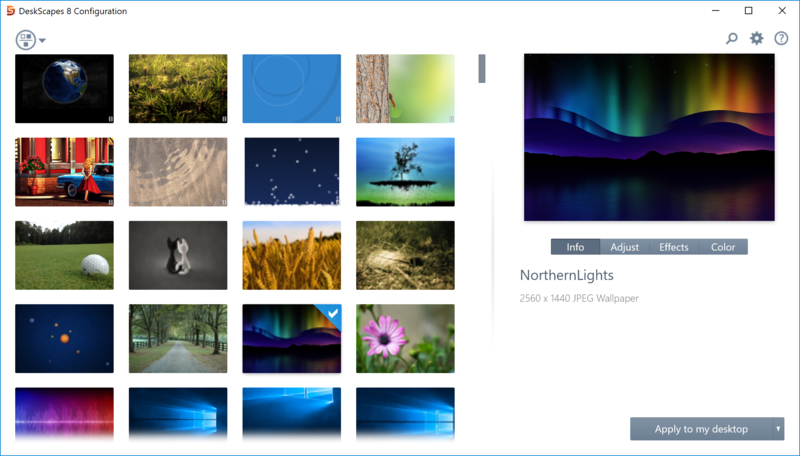 DeskScapes is an application for Windows 10/8/7 that lets you apply animated wallpapers to your desktop. It also gives you the ability to customize and manage static wallpapers by adding effects or recoloring your existing wallpapers. To purchase DeskScapes, click here. The screenshot below shows the DeskScapes user interface. The left side of the window shows all of your animated and static wallpapers. Choose which folders to display and add or remove folders from the "Settings" option. Tip! Animated wallpapers have a small filmstrip icon on their thumbnail preview so you can see which are animated and which are static wallpapers. Selecting a wallpaper will bring up a preview which is displayed on the right side of the window. If it's an animated wallpaper, it will display an animated preview so you can see what the animation is. Depending on what type of wallpaper you're using, there may be additional settings available. For instance, the "Expanding Shapes" animated wallpaper is dynamic, so it can be customized further. 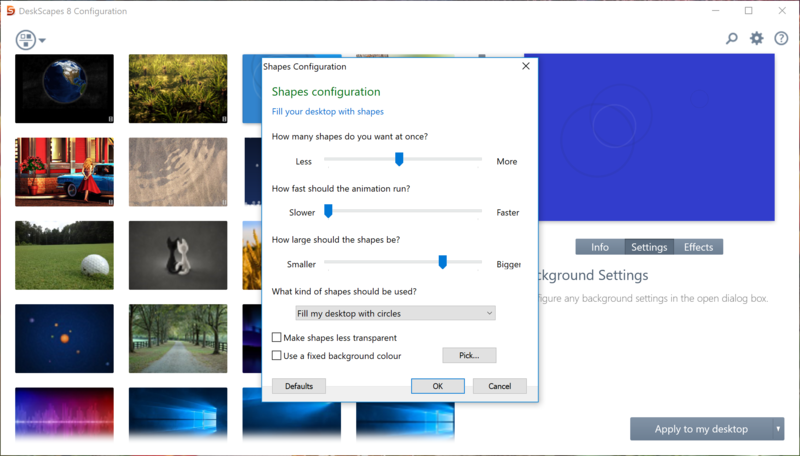 There are additional options to adjust the size of the shapes, how many shapes are used, and how fast the animation should be. Clicking the "Effects" tab will bring up a large list of available effects. These will work on both animated/static wallpapers, along with your images/videos. Examples include; Grayscale, Motion Blur, Textured, and my favorite, Snow. Selecting each filter will bring up a preview of the effect on your chosen wallpaper for a quick preview. DeskScapes also allows you to combine effects so you can create a custom look of your own. Tip! The Snow effect adds animated falling snow over your wallpaper for a very cool effect. After you've selected a wallpaper to use, simply click "Apply" on the bottom right corner of DeskScapes and your selected wallpaper will apply to your desktop. 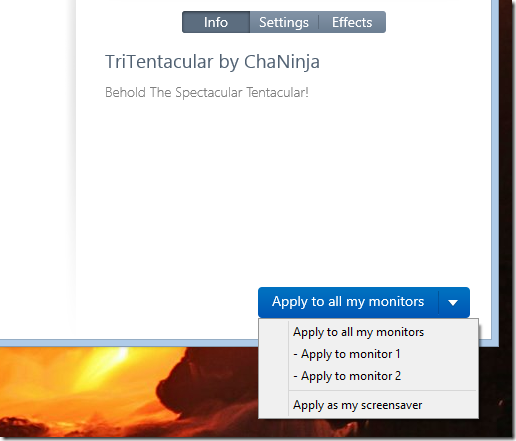 If you use multiple monitors you will also have the option to "Apply to all monitors", or select which monitor to apply the wallpapers to. Tip! DeskScapes lets you apply a different wallpaper to each monitor also! Learn more about DeskScapes here. DeskScapes is available individually for your Windows PC, but you can get that and more with a low-cost membership to Object Desktop. While you're a member, you'll get free updates, access to all betas, and any new apps for one year. You’ll also get access to other great programs like Groupy, Start10, Fences, WindowBlinds, Multiplicity, and more!